Please join us for a fly fishing school. On Sunday, August 26, a Backwater Angler Guide will be teaching a fly fishing school that is ideal for beginners. If you’re planning on flyfishing Maryland, or anywhere else for that matter, this course is a great introduction to the sport. The school covers knots, casting, gear and fly selection. Class is held from 11:00 AM till 2:00 PM. Cost is $100 per person and includes the use of gear. A Maryland non-tidal fishing license and trout stamp is required and may be purchased at the shop with check or cash the day of the school. Class size is limited to 4 and pre-registration is required. Please give us a call at 410-357-9557 to pre-register. This entry was posted in events on August 24, 2012 by Theaux Le Gardeur. 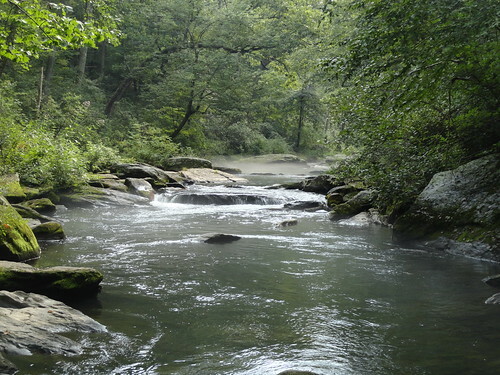 The Gunpowder River is flowing at 25 Cfs, is clear and 56 F. During the heat of the summer, low water on the Gunpowder does not necessarily mean that the water is too warm to fish. Fish are spooky but in the upper catch and release section. Water temps have been below 60 F in the first two miles of tailwater. River temps have been warming up a bit downstream of the catch and release area. Low water and small flies (mostly cream midges and a few BWO’s means that long leaders are a must! Terrestrial fishing is still the most effective way to cover water in August. Dropping a pheasant tail off a beetle is any easy way to cover riffles. 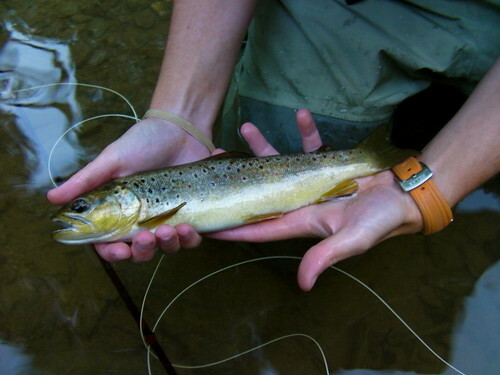 Small beetles, foam ants and hoppers are best fished in the remaining pools and runs. Trico’s in the #22 range are still worth a shot-especially upstream of Masemore Rd access. Thanks to Alex for the stream report and to Ed Lain (who was fishing nearby) who kindly took the great shot of Alex with a healthy Gunpowder Brown. I had a great day today nymphing the upper river. There were a good number of midges coming off throughout the day. Small bead head hares ear nymphs paired with zebra midges produced fish. I also picked up a few fish on cricket patterns and beetles. The fish of the day was this thick 15 inch brown. Hope all is well. This entry was posted in fishing report on August 17, 2012 by Theaux Le Gardeur. This entry was posted in news on August 13, 2012 by Theaux Le Gardeur. Please join us for a fly fishing school. 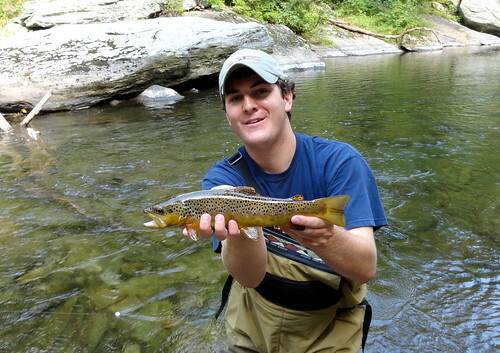 On Sunday, August 19, a Backwater Angler Guide will be teaching a fly fishing school that is ideal for beginners. If you’re planning on flyfishing Maryland, or anywhere else for that matter, this course is a great introduction to the sport. The school covers knots, casting, gear and fly selection. Class is held from 11:00 AM till 2:00 PM. Cost is $100 per person and includes the use of gear. A Maryland non-tidal fishing license and trout stamp is required and may be purchased at the shop with check or cash the day of the school. Class size is limited to 4 and pre-registration is required. Please give us a call at 410-357-9557 to pre-register. This entry was posted in events on August 13, 2012 by Theaux Le Gardeur. Backwater Angler has Moved to a New Location! 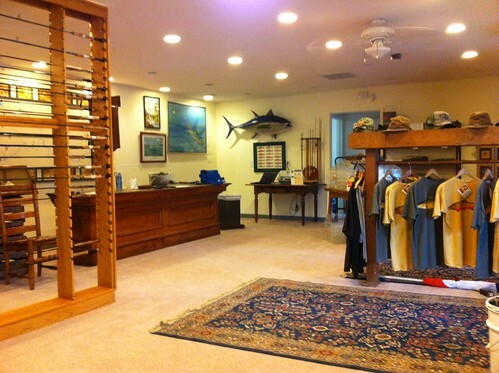 Backwater Angler just moved to 16938 York Rd, Monkton, MD 21111. The new shop is located in the bright yellow building in the center of town (formerly the Hereford Seafood building) just a long cast North of the old location. The new location has plenty of parking, a big lawn for casting and a great front porch. Stop in this weekend to check out the space, share fishing stories, get advice and pick up a free map of the Gunpowder River. Thanks for supporting your local fly shop! This entry was posted in news on August 2, 2012 by Theaux Le Gardeur. Please join us for a fly fishing school. On Saturday, August 4, a Backwater Angler Guide will be teaching a fly fishing school that is ideal for beginners. If you’re planning on flyfishing Maryland, or anywhere else for that matter, this course is a great introduction to the sport. The school covers knots, casting, gear and fly selection. Class is held from 11:00 AM till 2:00 PM. Cost is $100 per person and includes the use of gear. A Maryland non-tidal fishing license and trout stamp is required and may be purchased at the shop with check or cash the day of the school. Class size is limited to 4 and pre-registration is required. Please give us a call at 410-357-9557 or drop us a line at info@backwaterangler.com to pre-register. This entry was posted in events on August 2, 2012 by Theaux Le Gardeur. The Gunpowder River is clear, flowing at 75 Cfs and is 54 f. The river has come up from 28 CFs (the lowest constant level this year) to a more moderate flow. The river is now full bank to bank and we’re no longer looking at seemingly endless gravel bars. Increased flows, even at this moderate level also keep the river cool throughout its 18 mile length until it joins Loch Raven. During extremely low flow periods, water temperatures typically swing upwards of 15 degrees between the upper River’s catch and release section at Falls Rd and the put and take stretch downstream at Phoenix Rd. We have not had many reports of surface activity but there are a few olives and caddis coming off sporadically. The tricos are late this year but will doing their dreaded thing shortly. A better bet is to find meadow stretches and fish blindly to the banks with terrestrial patterns like ants, beetles and hoppers. Nymphing the riffles and pocket water with tiny bead heads and midge emergers has been productive especially when high sticking with a very short line. Nice new digs. Thanks for the fly recommendations. That bead-head nymph took 3 before becoming a victim of overhanging flora. A nice brown among them I might add. A couple more to follow. Not another fisherman all afternoon at Big Falls up. 54 degree water temp. You were right – they sure are spooky. Kayakers and tubers still giving it a go despite portages.With low water was wishing I’d brought a trash bag. As a thought You might consider passing them out judiciously at the shop. Not too bad but every litter bit hurts. An abandoned inflatable raft was one of the unsightly items observed. Water bottles, beer cans etc. too (unfortunately the norm it seems). Found myself with only half a rod as was walking out but backtracked and did find it in the grass.Whew! A few anxious moments there. Anyway, hope todays class went well and things work out at the new place. Will be in touch. P.S. Those new boots are great -like ’em and had no issues at all up at Penns last month. A Good trip by the way. This entry was posted in fishing report on August 1, 2012 by Theaux Le Gardeur.